Quality: From the minute you pick up a copy of Edge, you can feel the quality of the magazine. And when you look through its full-color, glossy pages, you can see the high-quality photography we’ve become known for. Combined with its professionally-written, locally-inspired stories, Edge enjoys a shelf life longer than most other publications. Expertise: We know the growing West Omaha market and what business owners and consumers want. While other publications offer the opportunity to broadcast to the masses, we realize that most businesses prefer to speak directly to their audience. Edge Magazine understands the importance of a more targeted approach to reach your desired consumer. 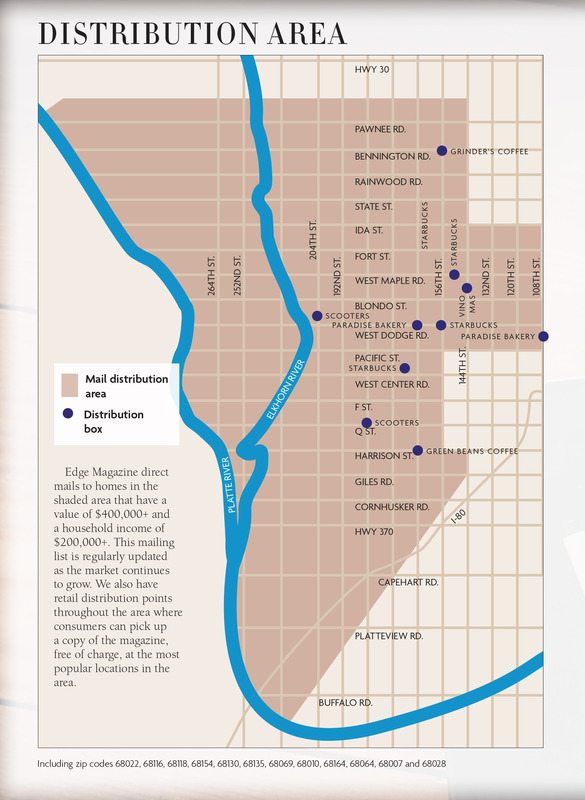 Distribution: By focusing our distribution area to one of the most affluent parts of Omaha, we ensure that your advertising is seen by only the most discerning potential customers. We direct mail to homes throughout West Omaha, Millard, Elkhorn, Gretna, Bennington, Waterloo, and Valley whose homeowners are between the ages of 30-60, have a home value of $400,000+ and a household income of $200,000+. This, coupled with our retail distribution throughout the area, helps to ensure our magazine reaches the hands of Omaha’s most discerning consumer. To request a media kit, please contact Kathy@EdgeMagazine.com, or Carole@EdgeMagazine.com.